In any vapor-firing process, such as wood, salt, or soda, wadding (small balls or rolls of a refractory clay mixture) is a must to keep surfaces from sticking together. Most potters mix up a batch of wadding, roll up little balls of the stuff, and stick ’em to the bottoms of their pots with spit or water as they are loading the kiln. But sometimes, as pots are repositioned in the kiln, wadding can fall off with this method, slowing down the kiln-loading process. Today, University of Alabama graduate student Jason Doblin explains the method the UA ceramics department has come up with to make wadding pots foolproof. – Jennifer Harnetty, editor. Anyone who fires regularly in a wood, soda, or salt kiln has to deal with the ever-present concern of wadding the bottoms of their pieces. Although the principle of wadding work is not complicated, the process can vary drastically among potters. Here’s the scenario, you have a bucket of wadding material handy as you begin to load your kiln. With each piece you form three balls, spit on them, and adhere them to the bottom of each pot. Next, you place each pot where you believe it will live in the kiln for the duration of the firing. What also inevitably happens is that you need to reposition a piece in the kiln because of another piece that would work better in its place. As you pick up the pot the wadding falls off, and the expletives begin. During my current graduate studies at the University of Alabama, we have started to employ a new method for wadding work that speeds up prep time and removes many of the headaches associated with having to reposition wadded work in the stacking process. What follows is what we do differently at the University of Alabama and what could possibly turn wadding ceramic work into a joy…okay, at least not a pain. Begin by filling the bottom third of a small bucket with 2800 grams (or approximately 6 pounds) of clay slop from your slop bucket. Weigh out 200 grams of alumina hydrate and pour this into your clay slop. Fill up a second small bucket with very fine sawdust (use nothing coarser that what would fall through a 20 mesh screen). Introduce the sawdust to the slop and alumina hydrate a handful at a time, continue blending the mixture until the consistency becomes like a workable clay consistency. Proceed to wedge this mixture until it is fully blended. Break the clay up into manageable sizes to roll out slabs. I prefer to use boards and a rolling pin to do this step, but a slab roller would be a fine choice if available. The clay should be rolled out to 3/8 inch thick (a thicker slab would be desirable for making wadding for large and/or heavy pieces). After the slab has been rolled out on a canvas mat, lay another canvas mat on top of it. Placing a hand on both sides of the slab, flip the slab over. This will cause the clay to release off of the canvas that it had previously been rolled out on. Trim off any cracked edges. Place a translucent plastic sheet over the slab. Impress vertical grooves into the clay, with a pizza cutter and a straight edge. After vertical lines have been impressed, proceed with impressing horizontal lines to create a grid. Remove the plastic sheet and allow the slab to dry. Break the slab into manageable sections and bisque fire. 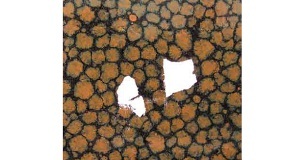 The individual pieces created by the grooves in the sections may now be broken off (in much the same way as two pyrometric cones are separated). Use a hot glue gun to adhere the bisqued square wads to the bottom of each piece. The glue will hold the wads in position through the stacking process, but will burn off during the firing. After firing, the wads can be knocked off the piece the same way conventional wadding is removed. Have questions about soda firing? Find out more in Gail Nichols’ well-researched book Soda, Clay and Fire. I have a stupid question. Can you use this in an electric kiln? I have tried these wads. They work great but don’t produce the same effect as standard wadding when it comes to the flashing circles. I would not use them for side wadding pieces. Well, here is the latest in firing a salt kiln in freezing temperatures. regardless of elmers or hot glue gun if the wadding is not bone dry before putting those pots outside the wadding will freeze and fall off. Have to leave my pots inside for 24 hours before allowing them to become frozen. Sometimes when loading I will heat the bucket of wadding in the microwave. Ah! the joys of summer firing, a long lost memory. I should have said, the wet shells after firing become lye. You just have to rinse well. another easy way to make wads is to roll out snakes and then cut the snakes to the size you need. unfired wads do glue on with Elmers. I finished loading a soda kiln this morning and glued the soft wads onto the pots. For large pots and also for decorative purposes, I use sea shells packed with wadding. They are nice because they crumble loose easily after firing. You can even soak the bottom of the pot to get them to come off. But becareful, the wet wads become lime and are caustic. This seems like a lot of extra work, We have everyone involved pre-wad their own pots. The trick we use is attaching the wads with elmers glue, it keeps the wads in place for the short term because it’s sticky and when it dries it dries pretty solid. I have never bisqued my wadding because I’ve been told that could actually cause warping…did I miss something? The reason the wads need to be bisqued is that bone dry wads do not adhere well with hot glue. Although elmer’s glue would work with bone dry wads, the hot glue with bisqued wads requires no waiting time for the glue to dry. In the studio atmosphere that we have here at UA, students are always scrambling to get work wadded while the kiln is being loaded. Hot glue allows them to do this while elmer’s glue would not dry in time. Some things will never change, namely, college student being synonomus with last minute. Also, the wads can be used over and over again after each firing, just glue them to the next pot. I do most of my work in a wood and soda kiln and have always rolled my wads in alumina hydrate and then just placed them or Elmer’s Glued them. I think this is a good way to produce a lot of wads at once but I am confused of why you are needing to bisque these pieces. I think you would be fine and not waste the electricity to bisque them just let them become bone dry and break them apart. I’ll have to try this style! Tony: Try making trivets. They work in any area of the kiln but are especially practical for the hot spots, especially the firebox; and they also open up creative possibilities for loading. mix it together to a clay consistency. Little cone shaped points, make sure the points are nice and pointy…but not weak. So you have a 1″ flat round cake. To it add three coneical shaped, 1cm ish sized pieces. for a 2 inch and 3 inch also there will be three cones. all must be level! for the 4″ and 6 inch increase the number of cones as needed. mainly go round the cake adding them a couple of inches apart, and tehn place one in the center. You only need them in the center as the size enlarges. These will thus be used to now make a plaster mold. It helps to write the number(backward in it) so as to know all your sizes when you start making multiples for a firing. then you can just ask whosoever is helping you to pass on a 3″ incher etc etc. make sure there are no undercuts. 7″ and larger ones can be made specialized, as you may/may not need as many of those., I like to throw the flat cake on teh wheel, and tehn add fat cones. The cone sizes vary in proportion as per teh size of the trivet. it also helps to have a air compressor. 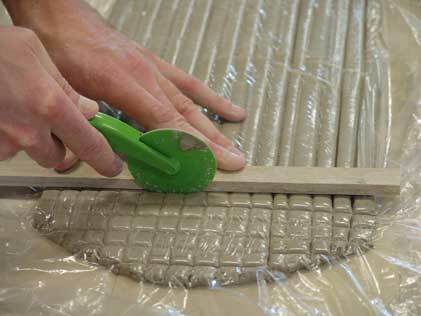 makes making the trivets from teh molds easier to pop out and less time consuming. the last 9 day firing i participated in as an assistant, i made about 400 of these in various sizes. I love them. I hope i have made sense. To bisque wadding sounds like a huge amount of extra work to me. I wad prior to loading by rolling up balls of various sizes to fit each piece and then glue them on with carpenter’s glue. Sometimes they are dry or stiff as I load. With a community of potters putting work in on loading day, most of theirs is soft.If one drops off, I have a bag of wadding in the kiln as I load and just spit it on. It seems to work. Spitting hundreds of pots, though, would be no joke. I use 60% Alumina Hydrate to 40% EPK, or 60% Alumina to 40% Fire Clay + silica sand to give it more body for posts and kiln furniture. At cone 10 to 12 the Alumina/EPK mix is very soft and can easily be knocked off or ground,or even rubbed off by hand with a piece of broken silicon carbide shelf. Any residue can be washed off with a stiff brush and water. It always helps to soak a stubborn piece of wadding in water to soften it up.However, if wadding is covered in thick melted ash/glass, no matter how soft the wadding, the glass will still need to be ground. At cone 14, on the floor of the Anagama/behind the coals, where all wadding is totally smothered with molten ash/glass I have not found any wadding that easily releases from the floor without a chisel,crow-bar or Sawzall. Does anyone have a wadding solution for these hot spots? It will work if your shelves are warped etc, if you don’t bisque them. If they’re raw, you can shape them to the size you want to stabilize your pots. Well, it’s always better to have fairly flat shelves though. Because you whole stack would be in jeopardy very soon I think. I like the idea. Here in Japan, we mix sawdust or rice hulls with some very coarse wadding clay. I sometimes add some alumina to it, when I use the salt kiln. I don’t when I just use the wood firing kiln. Just clay and rice hulls. We don’t bisque fire it. Why do that ? We just glue the small wads, of the necessary size depending of the size and weight of pots, with some paper glue. That’s good enough. But I’d like to know, what is the consistency of your clay slop ? I imagine that the amount of water in it is going to influence greatly on how much saw dust you add to it, and then the balance would not be right. If there is too much saw dust, it will begin to stick. And to answer Jan’s question: I think they are reusable, as long as you don’t take those that were used inside a salt or soda kiln to re-use them in a non-salt or non-soda kiln. As these tend to melt the second or third time you use them. This won’t work if your kiln shelves are warped or worn very much because you can’t use the wadding to level the pot. One question are these reusable? Great tip! I would like to offer a possible speed refinement, a technique I used to make tiny fake mosaic tiles for kids’ classes. Use a piece of fluorescent light fixture grid, the type that has open plastic squares, to impress the slabs into segments. Would be way faster than hand marking every line. I imagine there are lots of other grid stuff out there in various sizes. Thanks for the wadding tip…. And I LOVE me some Tom Barnes. He’s the best.